Competitors from the 409th CSB NCO of the year competition. Left to right: Staff Sgt. William Phipps, 928th Contracting Battalion, Staff Sgt. Justin Sawicki, 928th CBN, Staff Sgt. Kevin Brown, 928th CBN, Staff Sgt. Thomas Parks, 903rd CBN and Staff Sgt. Johnathon Robbins, 928th CBN. Photo by Master Sgt. Willie Signil, 409th CSB. 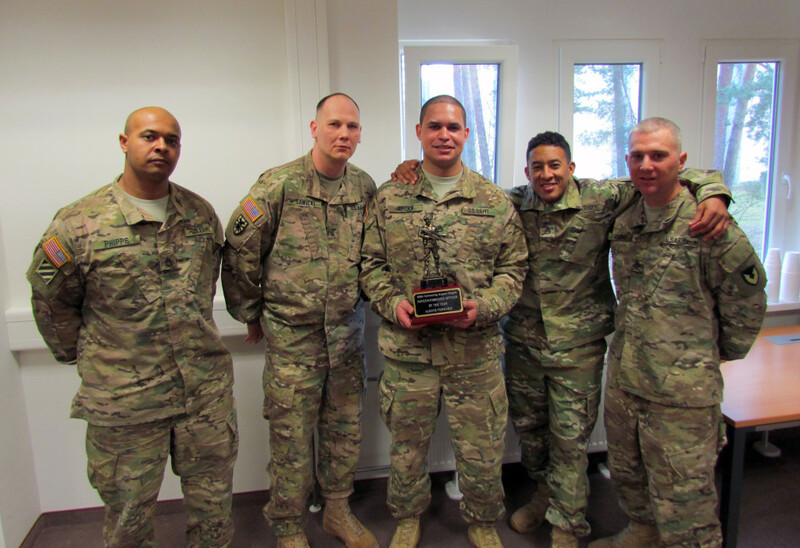 GRAFENWOEHR, Germany — The 409th Contracting Support Brigade has named its top non-commissioned officer of the year following a three-day competition in Grafenwoehr, Germany. Staff Sgt. Kevin Brown, 928th Contracting Battalion, was named 409th CSB’s top NCO for 2016. “This was a great competition. I think all of the competitors had fun and enjoyed competing against each other. The 928th Contracting Battalion CBN did a very good job facilitating the event and I think all of the competitors would say that,” said Brown. Brown and the other competitors were judged by a panel of senior NCOs on general military knowledge, appearance and military bearing. Then the troops went on to a multi-event competition, including a physical fitness test, weapon qualification, common task training, a 12 mile Ruck march and a written test. According to 409th CSB’s Command Sgt. Maj. Leatrice Person, it was the best competition to date. “The competitors were motivated throughout and really dedicated themselves. This is my last NCOY competition and I must say all five competitors were winners and I am proud of each one of them. I could not ask for a better way of leaving the 409th CSB as the command sergeant major,” said Person. Brown will move forward to compete at the Expeditionary Contracting Command/Army Contracting Command NCO of the year competition later this year. “First things first. I am going to recover from this competition, and then I will take what I learned from the competition and determine what my weak areas were and focus on those. I am confident that if I do that and maintain the areas where I did well, that I will represent the 409th Contracting Support Brigade well,” said Brown. Brown joined the Army in 2007 and this is his first contracting assignment.